Here’s Why You Should Choose This Crowthorne Clockhouse Log Cabin. The garden is a great asset to own and a modern well built log cabin will help to add to your enjoyment of it. And this is where the Trentan clock house log cabin really delivers. Its Georgian or plain glass windows appearance with ¾ length glass doors and 8 double opening windows allows light to flood into it allowing your family and you to enjoy the garden environment. Besides that, there are many uses for these garden cabins such as a leisure or recreation room, an exercise room, hobby room, summerhouse or glorified den for the children. All of these uses will allow for the most enjoyment to be had. Included as standard are Georgian windows bars to create this Georgian style, however, can be removed for a more contemporary look. The great design is key to this log cabin and is very adaptable. It’s crucial that your choice of a cabin is for one which is strong and well designed to suit the UK weather. 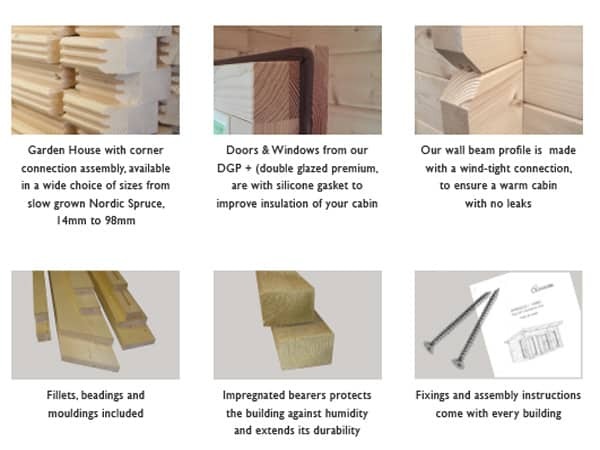 This is the reason Nordic slow growing timber is used as it’s renowned for being more stable in an outdoor environment. This timber is the mainstay of log cabins and outdoor buildings in Sweden and adds to their beautiful country. And if it will stand up to the weather they get then it will stand up to anything the British weather will throw at it. Also, the design of these buildings utilises the strength of the Nordic timber to ensure the strongest log cabin available to you. It’s relatively easy because of the clever design of this superb ‘Crowthorne’ Clockhouse log cabin it’s their modular construction for a good DIY’er to build it. Each interlocking log slots into place one at a time as it is built up. All sections are cut to size and are normally pre-assembled at the factory to ensure every part fits. They are then flat packed before being shipped to the customer. This ensures it’s ‘child’s play’ when you come to build it – well nearly. However, we can offer a log cabin installation service where the building can be built for you. If you choose this – it will definitely lighten the load and will save you time and effort. In fact we can offer a full range of services to make your life easier. All you would have to worry about is how to enjoy your new log cabin in your garden. Got to be worth considering! There are many websites on the internet offering log cabins for sale however you need to ensure you stay rational when looking at glossy brochures or these flashy websites. In an ideal world, they will deliver what you are expecting but the only way to be sure is to visit a log cabin display area and see for yourself. Near Woking as well as Farnham in Surrey, we have a log cabin display area. This is not too far away from the M25 where you can see examples of the Trentan log cabin range. Normally there is a good selection of cabins but you can be sure there will always be at least one similar to what you are thinking of. This gives you the opportunity to see how good the doors and windows are, the type of wood used as well as the build quality of the cabin and how good the doors and windows are. All crucial before buying. Even if you don’t visit the fact there are buildings for the public to see should give you confidence in their products. Size: This Crowthorne cabin is 5.3m x 3.8m in size (Smaller sizes available). Clock House Apex or Gable Style Log Cabins. Note this is the external size of the body of the cabin. The lugs extend 100mm on each corner making the overall size (as most other companies quote) 200m larger. We mention this so you know you are comparing ‘eggs with eggs’. Approximate clear internal size will be approx 5.2m x 3.7m. Please check with us if internal size is crucial. Cladding: Standard logs are 44mm thick, slot into each other and are cut from a top grade of Nordic Timber and this ensures the maximum stability and longevity of the timber. The log profile has designed wind-tight connections to ensure a superior resistance against wind. Untreated. Kiln dried timber from sustainable sources. Roofs: 18mm thick T&G boards used on the roof sections supported by strong roof beams. Roof beams meet EN 388 stringent standards. Untreated. Supplied with felt tiles (shingles) in either red, brown or green or Polyester based felt as standard.Additional roof overhang all round. Floors: 18mm thick T&G untreated boards used on these log cabin floors. No chipboard, OSB or other cheap sheet materials used on the floor, unlike some other log cabin suppliers. Sturdy floor joists are supplied and are normally spaced no more than 650mm apart. All floor joists are pressure treated for long life as standard. Doors: Joinery quality double glazed double doors 151cm wide x 175cm high – approx sizes. Georgian bars provided as standard or can be left off for a more modern look. Easy adjust hinges complete with gasket seals, fitted silver finish door handles, cylinder lock and two unique keys. Low doors sills giving you easier access into your log cabin. Supplied untreated. Beware of doors with single glazing or excessively high door sills. 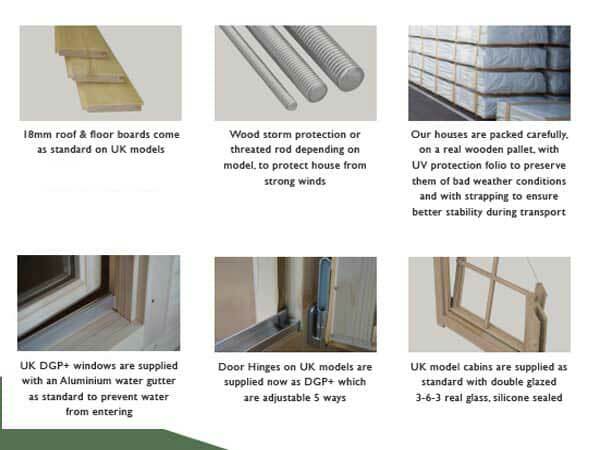 Windows: Eight (8) outward OPENING Joinery quality double windows included as standard. Size of each window is 60cm wide x 111cm high. Complete with easy adjust hinges, silicon gasket seals and delightful silver finish window handles. Supplied untreated as standard. Double glazed (3-6-3mm) and with toughened glass as standard NOT single glazed. Georgian Boards for windows are included FREE of charge. 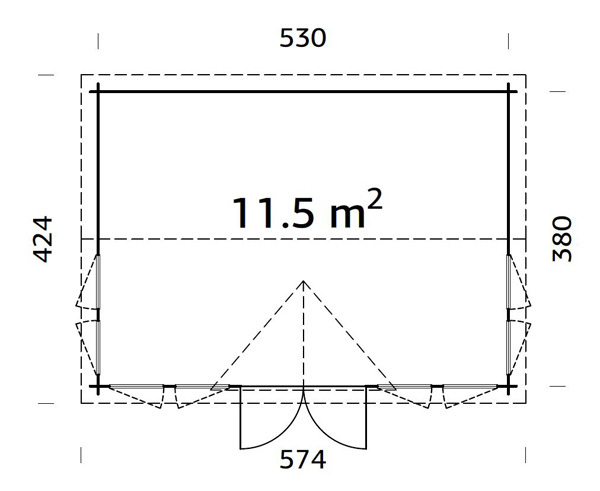 Lower Walls: Height: 2.2m – all Crowthorne clock house cabins. Ridge Height: Height. 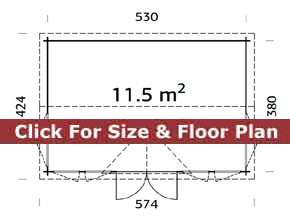 3.63m – on all Crowthorne garden cabins. Fitting: Log cabins are supplied in kit form for self erection. Option for installation through a third party if required. If being built you would require a concrete base or solid and level paving slab base. Optionally, we have an full range of other services available for you to make life easier. These cabins are assembled by interlocking the panels for ease of taking it down again if you decide to move. The Crowthorne is a new log cabin in the Trentan range. Full details will be added in the next few weeks. In the mean time please contact us directly for prices and specifications.